A trapezoid is a quadrilateral whose two sides are parallel. In the figure below, is a trapezoid and is parallel to . In this post, we are going to prove that in a trapezoid, the consecutive angles between a pair of parallel sides are complementary. That is, we are going to prove in the figure above that degrees and . In a trapezoid, the consecutive angles between a pair of parallel sides are complementary. Extend line segment at and locate point on the extended part as shown above. 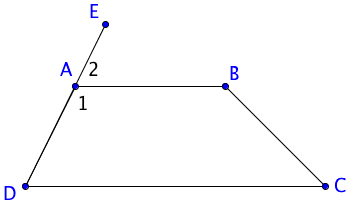 Label the angles angles as 1 and 2.
because they are a linear pair. because they are corresponding angles of the parallel lines containing and . and are supplementary by definition of supplementary angles.